The Crystal Tuner is tuned to a frequency of 4096 cycles per second (cps). With a frequency tuned to the pulsation of the Earth, the Crystal Tuner amplifies the healing power of crystals through sonic vibration. 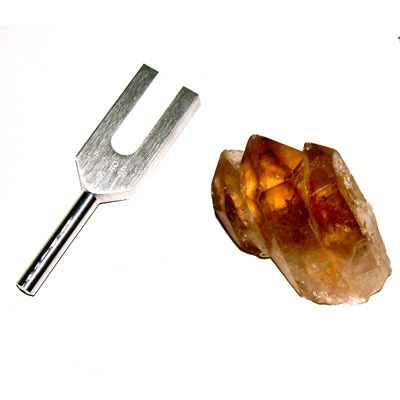 Enhancing a crystal’s ability for light conduction and powerful sound healing, when tapped on a crystal, this tuning fork forms a bridge between Heaven and Earth. When you lightly hold the Crystal and Crystal Tuning Fork, a pulsating wave moving between the tuning fork and crystal may be felt. The Crystal Tuner is tuned to a frequency of 4096 cycles per second (cps). This frequency is generated from an 8cps fundamental tone raised nine octaves (i.e. 8 cps, 32 cps, 64 cps, 128 cps, 256 cps, 512 cps, 1024 cps, 2048 cps, 4096 cps.) The 8 cps fundamental resonates with the pulsation of the Earth. The ninth octave of the upper overtone series begins with 4096 cps and is said to open the doorway to angelic kingdoms. Alexander Scriaben, the Russian composer, believed that this octave united Heaven and Earth and would bring forth a new era. His last composition “Mysterium” was to be played in India using bells hung from clouds sounding ninth octave harmonics. Hold a quartz crystal in one hand and the crystal tuning fork in your other hand. Gently tap the crystal fork on the rough end (not the point) of the crystal. Close your eyes and meditate on the sound as well as the feeling of the crystal in your hand. When working with another person, hold the crystal off the body with the point towards the area you want to energize. Gently tap the rough end of the crystal with the tuning fork. Let the sound move gently into the person’s energy field. Visualize it with color and/or spinning in a positive direction. There are many possibilities for the Crystal Tuning Fork. Let your creativity and healing ability be your guide. Please note that the Crystal Tuner is also included in the Angel Tuners set.